Hindu weddings are sacred affairs as per Hindu beliefs. It is one of the most vital ceremonies a Hindu performs during his/ her life. The Hindu marriages takes place amidst chanting of holy mantras and mediated by a priest. Hindu wedding ceremony commands a great ritual significance as it is strewn with a good number of rituals and customs. All these wedding rituals have adapted a new face while keeping the basic tenets intact. Hindu weddings are done in a puja form as per the Puranas. It is a Vedic yajna, a Vedic sacrifice where the devas or Gods are invoked. The Aryan deities are invoked in ancient Indo-Aryan style. It is performed in the presence of the fire-deity or the sacred fire known as Agni. By law and tradition, no Hindu marriage is deemed complete unless in the presence of the sacred Fire, the bride and the bridegroom have made seven encirclements. 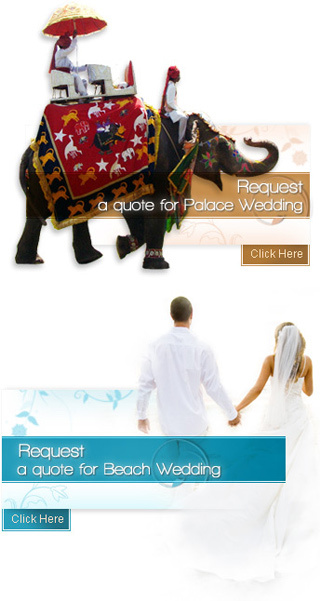 The Hindu weddings are conducted by the pandit or priest who is the master of ceremonies. The priest chants mantras or holy chants as prescribed in the holy books. He recites various prayers and seeks blessings for the couple. Usually both the bride and the bridegrooms parents are present at the wedding so that any minor variations in the two family wedding traditions can be resolved amicably. These days with changes in the thinking and shortage of time the ceremonies are not as long as they used to be. The tradition of inviting a lot of people is also receding slowly. The number of rituals performed is also less now with several of them losing their relevance. Certain ceremonies are now picked up by the families involved and the effect of other wedding ceremonies of other religions on Hindu weddings is also evident.